Inside the stems of Japanese bamboo plants, tiny farmers are working in secret. They tend to their crop of fungus, growing it in plump white clusters on their walls for eating, all while sealed safely away from the rest of the world. They begin farming the day they hatch—and when they retire, tuck some of their crop into their pockets to pass on to the next generation. The farmer is Doubledaya bucculenta, a species of lizard beetle. Many social insects (those that live in colonies) are well-known farmers. Leafcutter ants, for example, cut up all those leaves to feed to their own fungus crop. But farming in nonsocial insects, like the loner lizard beetles, is more mysterious. Wataru Toki of the University of Tokyo has been gradually uncovering the farming habits of D. buccalenta. Last year, Toki and other researchers announced that the beetle grows a certain kind of yeast (which is a fungus) inside bamboo plants. 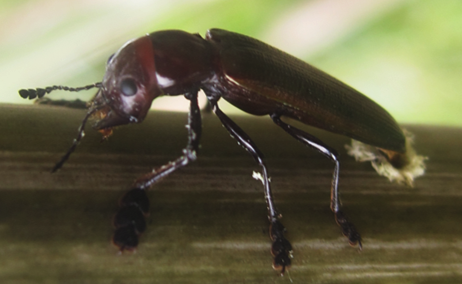 Each spring, female beetles come to bamboo stems, chew a hole through their hard walls, drop a single egg inside, and then seal the cavity back up. Bamboo stems have hollow sections separated by solid nodes. Inside this protected home, the egg hatches into a larva. The walls of its home end up covered in white fungus, which the larva eats. Once it's grown into an adult, the beetle chews its way back out of the bamboo and into the world. But female beetles, the researchers found, carry a little bit of their yeast crop with them. They store it in a kind of pocket built into the ends of their abdomens. Is this stash somehow passed on to the next generation of eggs? To find the answer, Toki and others carried out a number of experiments, including slicing bamboo stalks in half and videotaping the egg-laying process from the inside. After the mother beetle hacks into the plant (she has an asymmetrical head, which Toki suspects somehow helps her crack the tough bamboo), she turns around and sticks an organ called her ovipositor through the hole. She extrudes a single long, tubular egg, then makes several squeezing motions with her ovipositor before sealing the hole back up with bamboo fibers. This squeezing action seems to deliver the yeast from the mother's pocket into the bamboo plant. The researchers found yeast cells concentrated on the end of the egg and at the sealed-up bamboo hole. Left alone, this yeast can grow into a meager colony. But when the egg hatches, the larva emerges from the yeasty end of the egg and begins to wriggle around its home. Soon, lush yeast colonies sprout in its path. In other words, "The larvae actively spread the yeast," Toki says. Mothers pass down the crop to their offspring, and larvae start nurturing it as soon as they hatch. For the beetles, farming is a family business. Toki says it's still not known how mother beetles collect yeast in their pockets. "However, it is clear that they get the yeast before they leave the home—bamboo cavity—where they grew up." Next, Toki hopes to figure out how D. buccalenta prevents other microorganisms from invading its yeast farms. They may not be social, but the beetles have plenty to tell us.